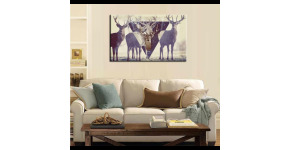 The stag, the animal with original and appeasing antlers is shown in a collection of deco canvases ! Discover unique settings with design stag heads or nature canvases for you to create a relaxed and Zen ambiance in your lounge or bedroom. 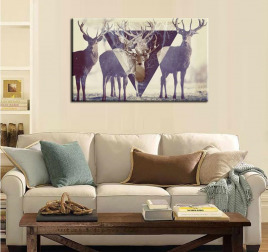 With abstract, off-the-wall but trendy visuals, those stag canvases will captivate you to be hung on your white wall. This decorative art print depicts some deer with a peaceful gaze, sublimated by a modern touch in the center. This trendy art print is 80 x 50 cm (31.50 x 19.69 po). Free delivery within 48/72 hours in metropolitan France for this abstract art print. Each wall decoration is treated to withstand UV and moisture.